Srinagar, in the Kashmir Valley in far northern India, is one of the top 10 hill station in India. A place of splendid natural beauty, it's often referred to as the "Land of Lakes and Gardens" or the "Switzerland of India". The gardens have a distinctly Mughal influence, as many of them were cultivated by Mughal emperors. Although civil unrest is an ongoing concern in the area due to conflict with nearby Pakistan, calm has been restored and visitors are returning to the area. (Read more about how safe is Kashmir now for tourists?). Nevertheless, be prepared to see army personnel and police everywhere. Find out important information and travel tips in this Srinagar travel guide. Srinagar's Sheikh ul-Alam airport was completed in 2009 and is owned by the Indian Air Force. It can be reached most easily by flight from Delhi. There are also flights from Jammu, Mumbai, Ahmedabad, Chandigarh, Amritsar, Kolkata, Bangalore, and Lucknow. The Jammu and Kashmir State Road Transport Corporation operates an inexpensive bus service from the airport to the Tourist Reception Center in Srinagar. Otherwise, expect to pay about 1,000 rupees for a prepaid taxi (2018 prices). App-based taxi services such as Uber and Ola don't operate in Kashmir. If you're traveling on a budget and are feeling adventurous, you may try taking an Indian Railways train to Jammu (these trains start from Delhi or pass through Delhi from other cities in India), and then go by shared jeep/taxi to Srinagar (traveling time around eight hours). Buses also run but they are much slower, taking around 11-12 hours for the journey. A rail project is currently underway to link the Kashmir Valley with the rest of India, but it's well behind schedule and isn't expected to be completed until after 2020. Tunnels are also being built to cut the travel time from Jammu to Srinagar by around five hours. Foreigners (including OCI cardholders) are required to register upon arriving and departing from the airport. It's a straightforward process that requires the completion of one form and only takes about five minutes. Do note that US government employees and government contractors who have security clearance are not permitted to visit Srinagar, as Kashmir is off-limits. Traveling to Kashmir could result in loss of security clearance. The kind of experience you want to have in Srinagar will determine the best time of year to visit. It gets very cold and snows from December to February, and it's possible to go snow skiing in surrounding areas. If you want to enjoy the lakes and gardens, visiting between April to October is recommended. April to June is the high season. The monsoon usually arrives by mid July. September to October is also a good time to visit, and is not so busy. Foliage turns lovely deep, warm colors in late October, as the weather becomes colder. Temperatures get quite hot during the day in summer, but are chilly at night. Make sure you bring a jacket! Check out these top Srinagar attractions and places to visit. 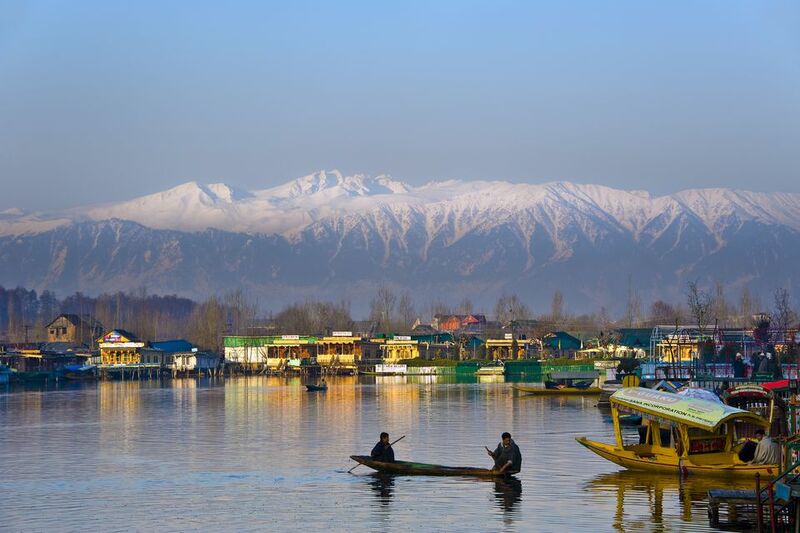 Srinagar is most well known for its houseboats, a legacy of the British that has rapidly multiplied. Don't miss staying on one! Avoid booking houseboats from tour operators in Delhi. There are plenty of scams and you never know what kind of boat you'll end up with! Reputable houseboats can be booked at Srinagar airport, and many have websites as well. Have a read of these tips for choosing the best Srinagar houseboat to find out what you should consider. The main commercial and tourist district, where most of the accommodations are situated, is Lal Chowk in the heart of Srinagar. It's located within close walking distance of local markets and the Jhelum River. Walking time to Dal Lake from Lal Chowk is about 30 minutes. If you prefer to stay closer to Dal Lake, you'll find plenty of budget hotels to choose from along Boulevard Road, which runs along beside the lake. Otherwise, if money is no object, the best luxury hotels are the Lalit Grand Palace and the Taj Dal View. Hospitality Home is the most popular homestay in Srinagar and it's also inexpensive. The annual Tulip Festival takes place during the first couple of weeks of April. It's the highlight of the year in Srinagar. In addition to being able to see millions of blooming tulips in the biggest tulip garden in Asia, cultural events are held. Indian tourists often prefer to conduct their trip on an auspicious note, with a visit to Vaishno Devi shrine. It's best reached by helicopter from Katra, about an hour and a half from Jammu. Otherwise, these popular tourist places in Kashmir can be visited on day trips (or longer side trips) from Srinagar. If you have a cell phone with a prepaid connection, your SIM card will not work as roaming has been blocked in Kashmir due to security reasons (postpaid connections are fine). Your hotel or houseboat may provide you with a local SIM card to use. Note that being a predominantly Muslim area, alcohol isn't served in restaurants and most businesses shut for prayer at lunchtime on Friday in Srinagar. Bars can be found in select upmarket hotels though. If you're flying out of Srinagar airport, do get there with plenty of time to spare (at least three hours before departure), as there are lengthy and multiple security checks. There aren't any restrictions on cabin luggage when flying into the airport. However, when departing, airlines often won't allow cabin luggage except for laptops, cameras and ladies handbags. If you go to Gulmarg, you can save yourself a lot of time and hassle by booking gondola tickets online or in advance at the Tourist Reception Center in Srinagar. You'll face huge lines at the gondola otherwise. In addition, avoid visiting Pahalgam during July as it will be extremely busy with pilgrims going on the Amarnath Yatra. Do be aware that you should dress conservatively to respect the local Muslim culture.